This property is ready to move into now! Please note this is independent editorial content written by a PropertyMash Journalist. While we try to ensure all information is as accurate as possible, please double check with the developer or real estate agent directly before making a purchasing decision. The information contained within this article may be incorrect or out of date. UPDATE JUNE 2018: WEST SIDE IS NOW READY TO MOVE INTO. ONE, TWO AND THREE-BEDROOM APARTMENTS FROM $416,000. 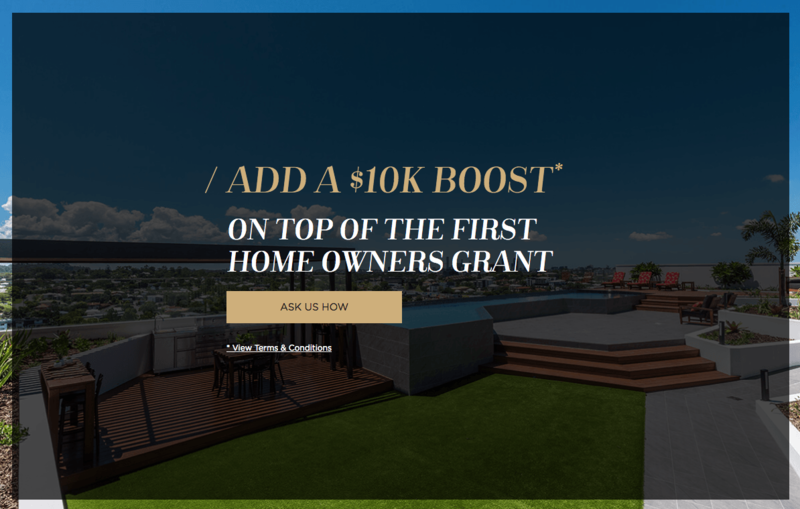 Until June 30, add a further $10,000 developers boost to the $20,000 First Home Buyers Grant! Westside is located at 30 Musgrave Road, Indooroopilly. This is directly opposite Indooroopilly Shopping Centre. The project offers a range of one (1), two (2) and three (3) bedroom units. It is likely that this project will attract young professionals, university students and investors. Each of these buyers will be drawn to Westside because of its location and the amenity that surrounds it. It is across the road from Indooroopilly Shopping Centre which has 360 specialty stores and is one of Brisbane’s premier shopping centres. 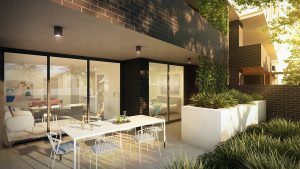 The project is walking distance from a major bus interchange and a train station. It is also a 10 minute drive or bus ride to UQ. 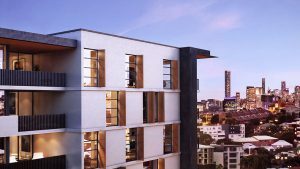 Westside offers 119 apartments over 9 levels. There are 36 x one bedroom apartments that are approximately 53m² internally with balconies that range from 11m² to 13m². On the ground floor of the building, there are several one bedroom apartments that have 23m² courtyards. These are priced from $360,000. One TreeLuxury new apartments in the Sunshine Coast suburb of Sippy Downs. Banyan Tree ResidencesLuxury riverside apartments with fantastic amenities and benefits for residents. The two bedroom apartments range from 75m² to 99m² internally with balconies from 13m² to 23m². Again, there are several two bedroom units that have quite large courtyards ranging from 31m² to 52m². These courtyards are really well designed – particularly with the exposed brick feature. Courtyard units feature exposed brick. Supplied by developer. 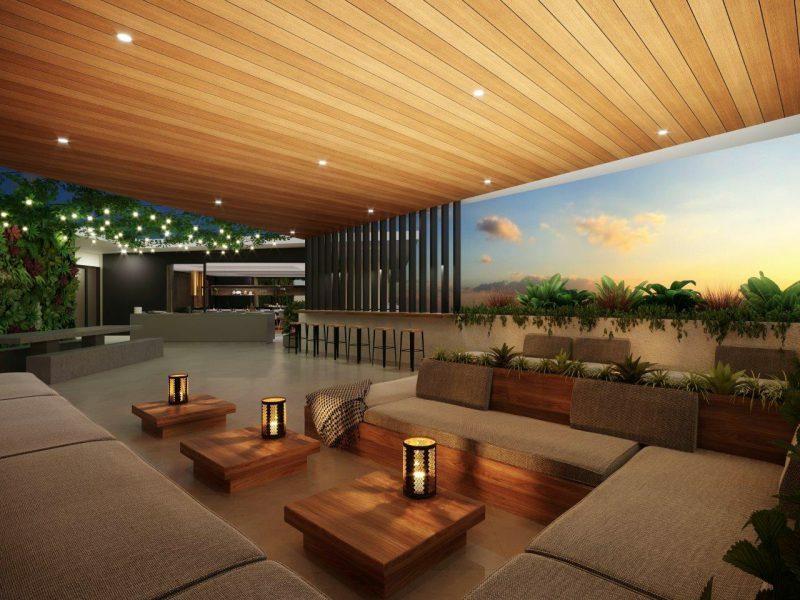 The three bedroom apartments are located on the northern and southern faces of the building and they will definitely offer the best outlook, particularly on the higher levels. From higher up, these units will get views over the city, Mount Coot-yha and the Chelmer Reach of the Brisbane River. These apartments are priced from $690,000 and have several great internal features such as butler’s kitchen and separate laundry. Many units will get city views. Although the Eastern side of the building will get city views on higher levels, the bottom four levels will look into Indooroopilly Shopping Centre’s car park. Apartments on the western side of the building will overlook apartment buildings. 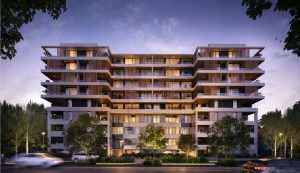 Each apartment at Westside comes with a single car park and there are 18 guest spots. Early buyers can purchase another parking space (from a pool of 17) for $40,000, if they wish. This is worth keeping in mind, as there is limited street parking around Indooroopilly Shopping Centre. There is also the option to purchase several one bedroom apartments that have no car park. This is a great thing to see in an apartment building in Brisbane in our view. Particularly at this project because a car-free life would definitely be possible with the location, being right beside Westside and a wide selection of great public transport within walking distance. It is potentially one of the few suburban locations in Brisbane where this would be the case. Render of the rooftop pool deck. Supplied by developer. 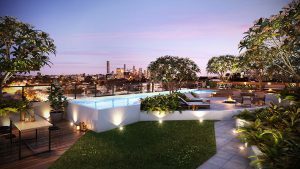 The rooftop level of Westside has been designed as a landscaped pool deck with BBQ area that overlooks the city. 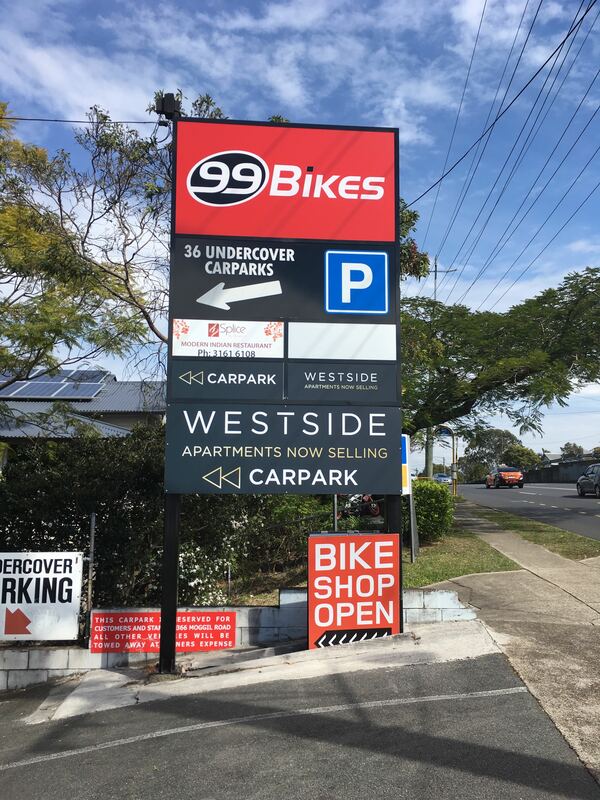 Westside is located at 30 Musgrave Road, Indooroopilly. 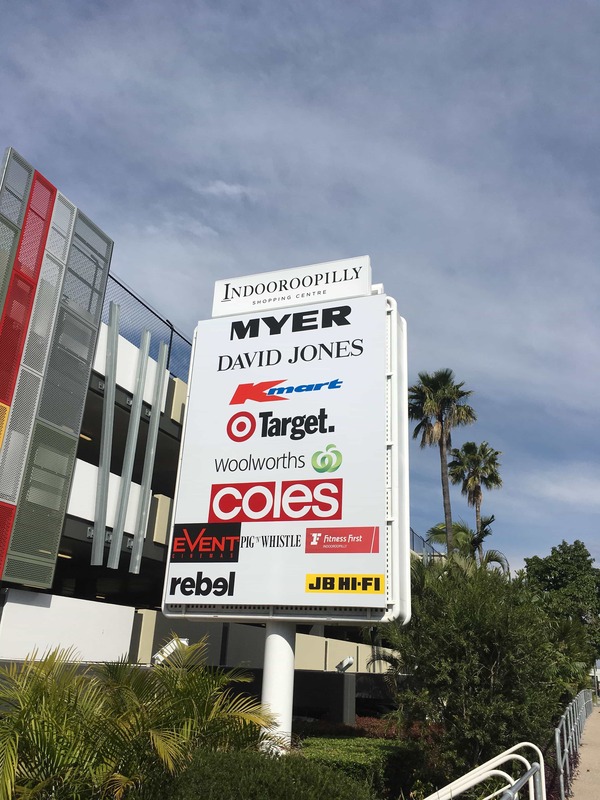 This is across the road from Indooroopilly Shopping Centre, which recently experienced a $450 million upgrade and is now home to 360 specialty stores. Stores of note inside the complex include Coles, Woolworths, Indooroopilly Fruit, Cabassi Butcher, H&M, UNIQLO, David Jones and Glue Store. Residents of Westside would be able to walk to all of these retailers and more in 1-2 minutes. Indooroopilly Shopping centre is across the road. Photo taken 17/08/2016. On top of this, Station Road is a cafe and dining precinct in its own right. Some standout places include Nantucket Kitchen & Bar, Nitrogenie, Harajuku Gyoza and Wray Organic. Indooroopilly Shopping Centre also serves as a major bus interchange for the western suburbs of Brisbane. here are 30 bus routes that run through this station, which is located outside Indooroopilly Shopping Centre. The routes that run through this station head to all major employment, education, retail and recreational areas in Brisbane. For example, residents could get to the city in about 30 minutes at peak hour or go to UQ in 10 minutes. There are many other schools in Indooroopilly aside from UQ. Indooroopilly State School is a highly regarded primary school that is only five minutes walk from Westside. In terms of secondary education, Brisbane Boy’s College, St Peter’s Lutheran College, Brigidine College and Indooroopilly State High School are all easily accessible from Westside. There are lots of parks and walking paths in Indooroopilly which make afternoon walks really enjoyable. For example, Moore Park is a 5 minute walk from Westside. It is a large forest reserve with lots of walking paths and open space. Indooroopilly is a suburb in Brisbane’s West. Being 6km from Brisbane’s CBD, it is in the middle ring. The population of Indooroopilly increased by 8% over the five years between the 2006 and 2011 Census to record a total population of 11,672 people. The median apartment price in Indooroopilly is $500,000 and the median weekly rent is $410. Many young people live in Indooroopilly. The predominant age group is 15-24, followed by 25-34. Neighbouring suburbs include Chapel Hill, Toowong, Taringa, St Lucia, Fig Tree Pocket and Kenmore. Overall, the finishes at Westside are good quality. 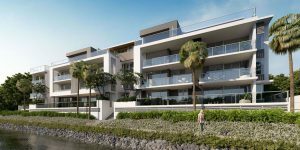 These apartments are finished to a higher standard than the average apartment on the market in Brisbane today. On top of this, the interior design is quite appealing in our opinion. Features like the large hexagonal tiles in the bathrooms or the exposed bricks of the courtyard units are great touches. Finishes board inside the sales display. The top half is the light colour scheme whilst the bottom half is the dark scheme. Photo taken onsite. 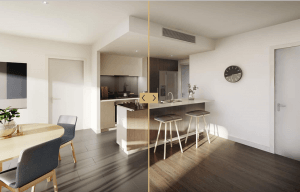 As with most new developments in Brisbane, buyers at Westside are given the choice between two colour schemes – light or dark. Most projects have one scheme that looks clearly nicer than the other, however at Westside we’d have to say that they are both done nicely. 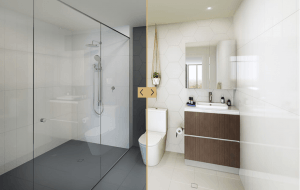 The photos below show the contrast between these two interior options in the bathroom and the kitchen. Dark bathroom vs light bathroom. Dark kitchen vs light kitchen. Each apartment in this development comes fitted with Bosch appliances. These are good quality European appliances are a cut above the standard. 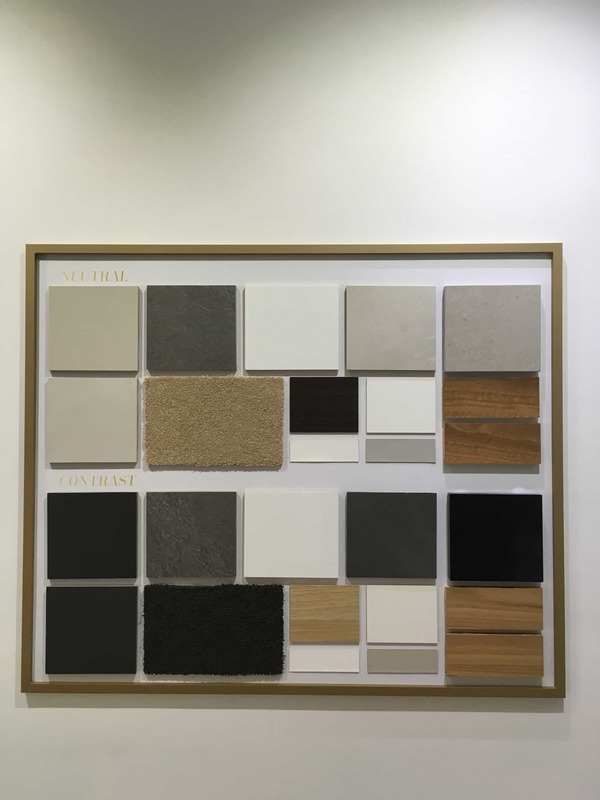 The kitchen benchtops are 20mm thick stone, which is the new standard in apartment design. The splashback is glass, which looks quite nice. The cabinetry is all timber veneer. The bathroom cabinetry and bench top is in the same design as the kitchen. 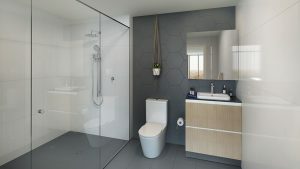 Render of the bathroom showing the hexagonal floor-to-ceiling feature tile. Supplied by developer. The bathroom has a hexagonal feature tile. Although this design is becoming more and more common in Brisbane, we feel that this particular one has been done tastefully. The hexagonal tiles are large and they are placed so that they divide the shower and vanity area. This means that there are not too many of them and they aren’t overdone. These apartments have ducted air conditioning throughout. Yearly body corporate rates range from $2,900 to $3,700 at Westside. 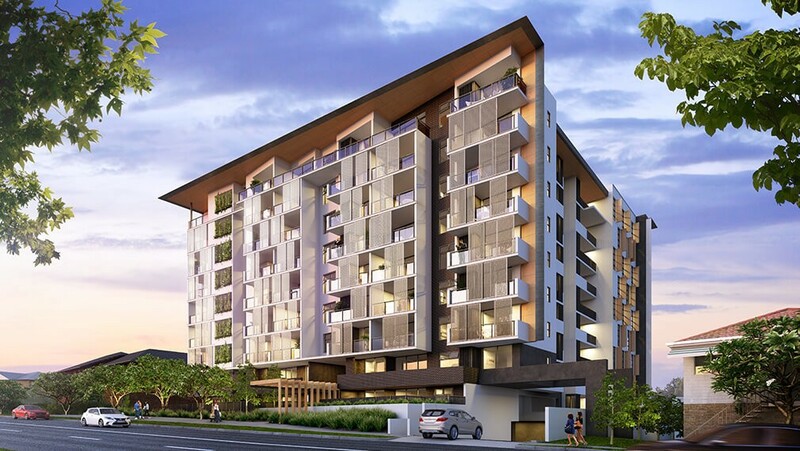 Local competition to Westside includes Evoque in Indooroopilly, as well as Landmark, Serenity and Sense in Toowong. Westside is being developed by Village Building Co. This company has over 27 years experience in the development industry and have completed projects across Australia. They have completed house and land packages, apartment buildings and mixed use developments. Their website shows a long and impressive list of projects that they have completed across several states. McNab is the builder for this project. They are a Queensland based builder that is considered to be ‘mid tier.’ They complete construction projects across a range of industries. 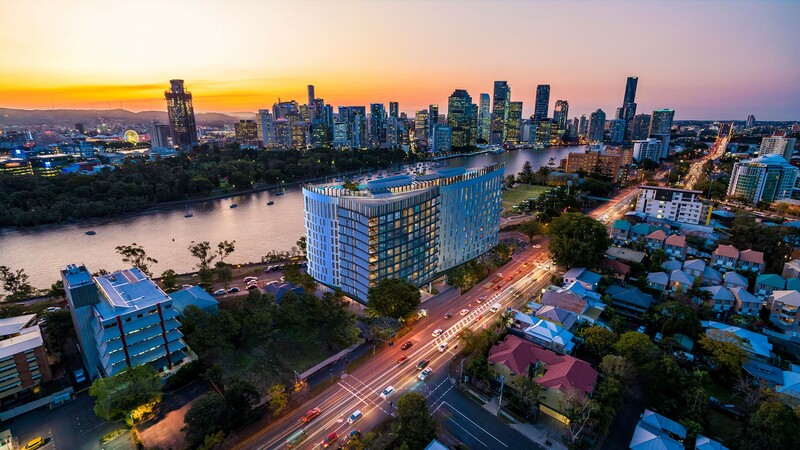 Projects that they have worked on have been awarded Best Overall Development in Australia and Best Overall Development in Queensland by the Australian Property Council and the Urban Development Institute of Australia. 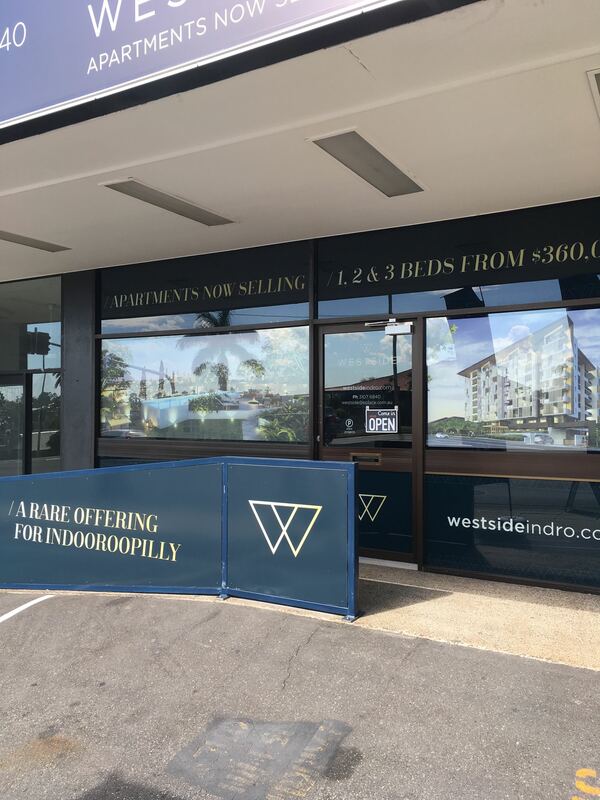 The sales display for Westside is located at 366 Moggill Road, Indooroopilly. There is a large sign off Moggill Road that will point you down to the car park where there is plenty of space for parking. This is not the actual development site, so don’t be put off by how busy Moggill Road is. Whilst Musgrave Rd will still carry plenty of traffic in and out of the shopping centre, it will not have the busy traffic that Moggill Rd carries. Sign to car park from Moggill Road. 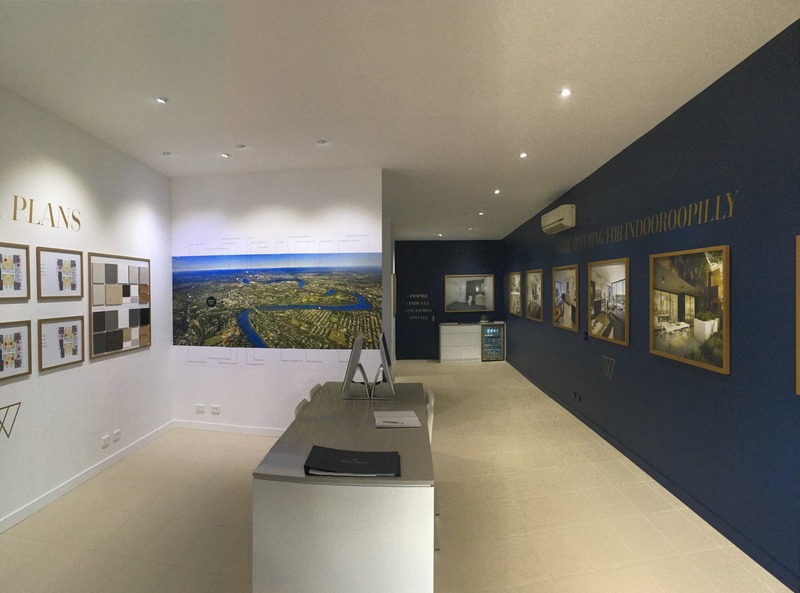 Opening hours for the display are 10am to 4pm Monday to Sunday or by appointment. The sales display for this project is truly worth visiting. It has a great fit out and the agents are extremely helpful. There are examples of the finishes inside the apartments and large photo renders of what it will look like. For people that aren’t familiar with Brisbane, there are also huge annotated maps inside the display. Inside the sales display. Photo taken onsite. 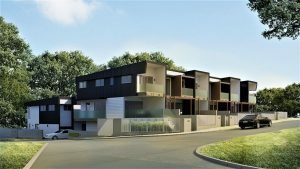 Until June 30, Westside Indooroopilly is offering an extra $10,000 in a developers grant to all eligible First Home Buyers. Combined with the $20,000 First Home Buyers Grant, that’s $30,000 off your first home! No problem Grapheme! Glad you are enjoying the site. If you need any extra information please get in touch!